Tricia Stringer is a bestselling author of novels across three genres: historical saga, rural romance and now, women’s fiction. Her first book, Queen of the Road, won Romantic Book of the Year in Australia and she has been shortlisted for more awards. 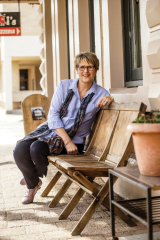 Tricia has spent many years in education as a teacher, a librarian and in middle management; with her husband she took on the first licensed Post Office in South Australia where they included a bookshop, and she now works as a full-time writer. Tricia travels Australia and sometimes overseas researching and drawing inspiration for her novels which always feature an authentic Australian voice. Home is a place near the beach in rural South Australia. 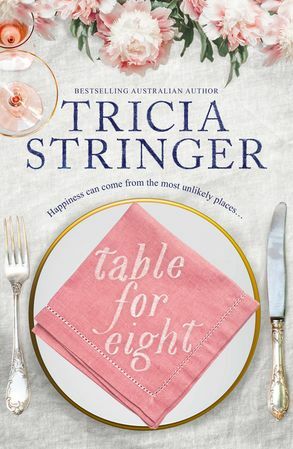 Table for Eight is about troubled relationships, second chances, and love (both old and new). What inspired the idea behind this book? I love cruising. I took my first cruise a couple of years ago to celebrate a friend’s special birthday. The first night at dinner I was seated at the wrong table where a charming woman of senior years welcomed us as if we were in her private dining room. We were all strangers but somehow she managed to put us at ease and we were soon chatting like old friends. I didn’t meet the woman again but she intrigued me and so I named her Ketty and made up a back story. Then I brought seven other characters to her table, each of them an interesting addition, and the story evolved from their interaction. The novel is set on a cruise – a very interesting choice of space indeed! Was there a specific reason for selecting this setting? How does it influence the characters and story? A cruise ship is like a small town. There’s such a mix of interesting characters and they’re all aboard a floating resort from which they can’t escape – the perfect setting for a story. It’s a wonderful environment for characters to try and forget home and work life and perhaps imagine themselves as someone different, to try new experiences and transform themselves. Your writing style is very much centred upon creating convincing characters in realistic situations. How do you achieve this? How do you ensure that your stories and characters are as genuine as possible? Research is very important to me. I took a short cruise from Sydney purely for research. I wanted to know firsthand what it was like to sail under the Harbour Bridge and out through the Heads. I also got the chance to talk to some of the cruise staff and ask a few questions, some of which caused raised eyebrows but when I assured them I was a writer doing research they were very helpful. My characters evolve as they interact with other characters, the situation they’ve been placed in and the setting. I spend a lot of time getting to know my characters, they seem like real people to me and I think this makes them convincing on the page. Who do you think will enjoy Table for Eight? Any reader who wants to enjoy a read that makes them feel as if they’ve been on a holiday with my characters. That’s my main wish for readers of my books, that they relax and escape for a while. What are you currently reading and/or writing? I’ve recently finished Into the Night by Sarah Bailey and started The Right Place by Carla Caruso. I like to swap between genres. And my next book is nearly done and another begun. I’m always writing.